All weekend, I was hitting my big box hoping to find someone that "accidentally" put A&G on the shelf early. So far, no luck, but I plan to head out after I schedule this post. But looking that close at the card aisles reminded me I completely forgot that Stadium Club just dropped. In three different stores, I made separate purchases. It was a reminder that you should avoid buying blasters from different stores, because half of the 2nd blaster was dupes of the first. I like Stadium Club, so let's look at a few cards, if you haven't already. And if you have, well, feel free to click over to another blog. There's always a chance I could post something better tomorrow. 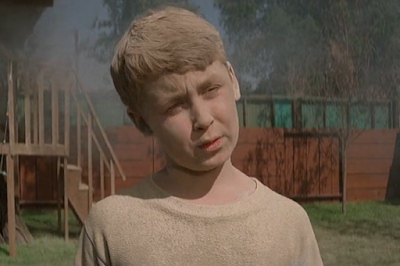 Retail has exclusive sepia parallels. Not the best selection of players. At least the D-Backs unis look a 100 times better in this color. Here is an advantage of dupes - binder needs. Then again, it's cheater Ryan Braun. Maybe you need to give back your award, jerkface. Nice card for Porcello. Sports Illustrated shoot? 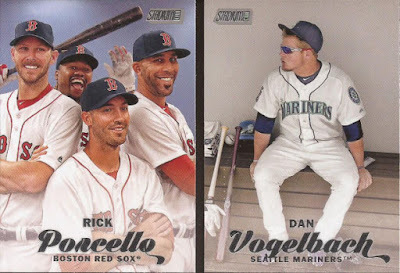 And that Vogel-monster scan is so you can see what his card looks like, P-Town Tom. Did Koufax ever take a bad picture? Great card!!!! 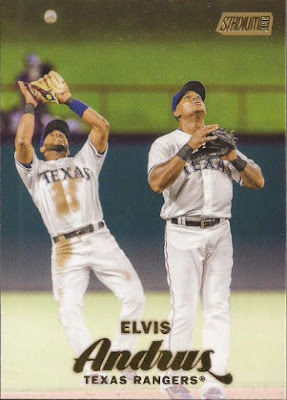 Love that Topps has forever chronicled the screwing around of Andrus and Beltre. 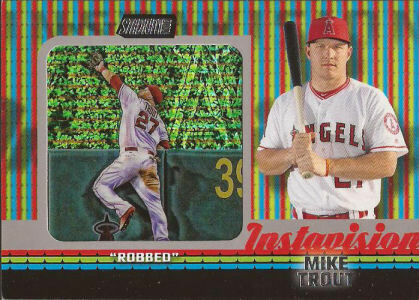 I ripped a box of SC last year (I'll probably do one this year), but in that box, I pulled a Crystal Ball card of Mike Trout. Well, sure enough, the first blaster Trout'd me again with a rare card. Instavision is a case hit, so nice for this to drop out of a blaster. The inserted image is foil board, which is why is scanned so bright. I could make back the cost of the blaster on this card if I so desired. But that was not the only card from that blaster that was rare. This is a gold Chrome Minted refractor, also a case hit. So one blaster - two case hits. I like when the odds fall in my favor. I could probably pay for the other blaster with this card. No idea if Topps shopped that one, and frankly, I don't care if they did. 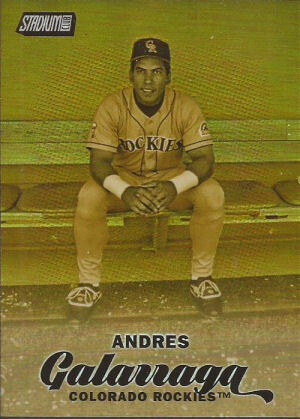 That is a great baseball image, and an amazing piece of cardboard. If it's fake, props to the guy that thought about it. If it's real, there is a photographer out there owed a Pulitzer. Looks like you picked out a couple splendid blasters there! Nice pulls on the Trout and Big Cat. Love the Porcello, Andrus, and just about all the others you showed here...but, like you, the Hamilton is by far the best card I've seen from Stadium Club this year. Cool stuff. I like the look of that Instavision card. Would have been neat had they used a lenticular inserted image instead of just foilboard. Still, though, send it to me. I can't believe the Trout uses THAT picture again! There have to be at least 50 versions of his 2016 card with that picture (counting Chrome, Opening Day, Holiday, team sets, and all the parallels thereof), yet here it is again. 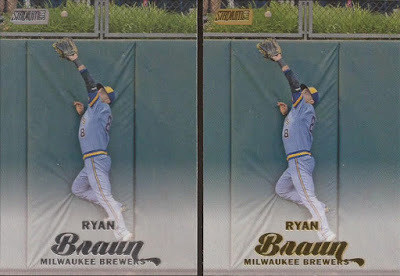 Speaking of parallels, it looks as though one of the Brauns you show as dupes is a gold, and the other isn't. Can't stand the Rangers... but love me some Andrus & Beltre. 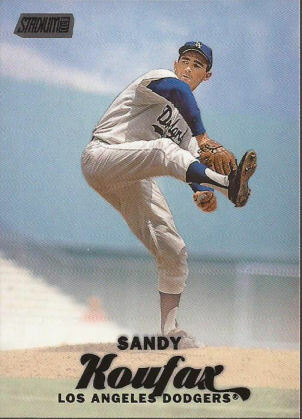 That Koufax is beautiful. So is the Hamilton. Solid pulls! Instavision is cool. Wow, I hadn't seen the Andrus card yet. I love the relationship between him and Beltre. 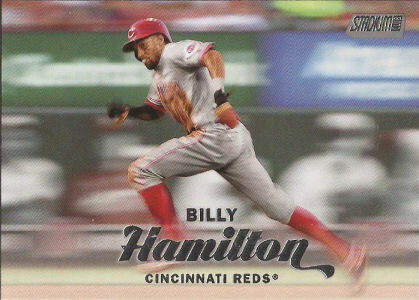 You're right, the Billy Hamilton is the perfect card for him. I don't know if one card has every described a player's skill set so perfectly before. FYI, if that Vogelmonster would happen to find it's way to my mailbox then I'm sure I could scrape together some cards that would fit in your wheelhouse. That Trout is still pretty nice.